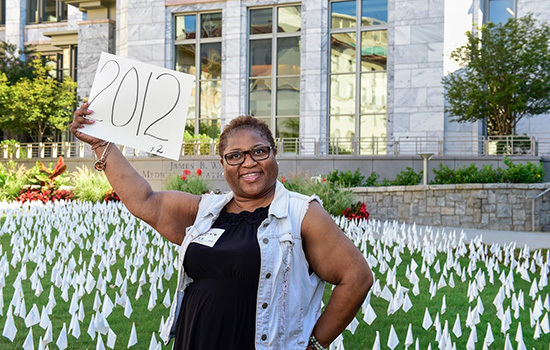 During the celebration, bone marrow transplant recipients held up signs with the year of their transplants and joyously reunited with doctors and nurses who had cared for them. The Bone Marrow and Stem Cell Transplant Center at Winship Cancer Institute hit a milestone this spring when Glenn Pontoo became the 5,000th patient to receive a bone marrow or stem cell transplant. Pontoo, a multiple myeloma patient, was transplanted on June 20. 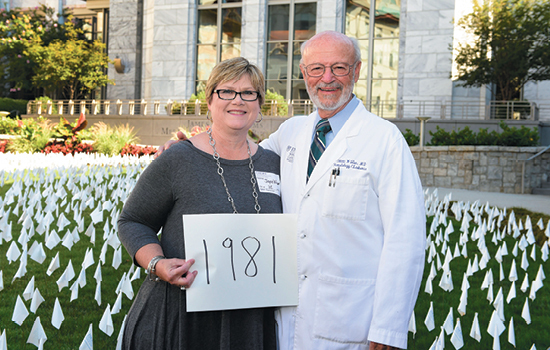 The very next day, he came down from his hospital room to the School of Medicine lawn to take part in the celebration and plant the 5,000th flag. 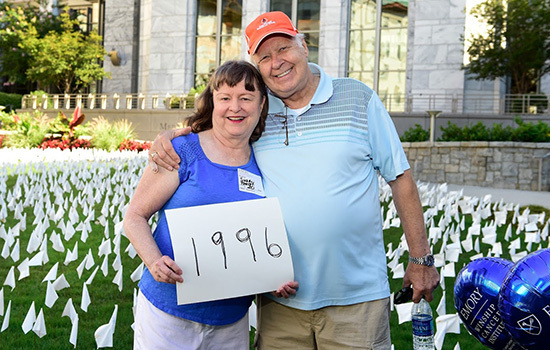 A week earlier, BMT nurses, patients, doctors, research coordinators, hospital staff, volunteers, and other Winship friends planted 4,995 flags on the lawn to represent all the patients to date. 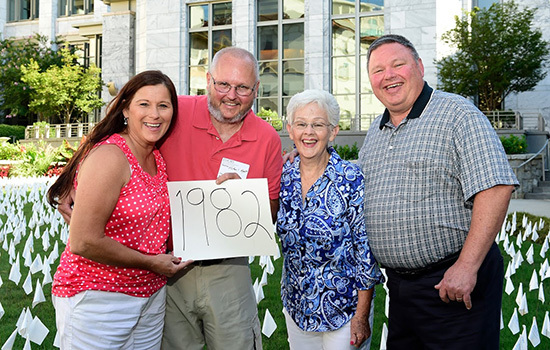 On June 21st, an enthusiastic crowd came to celebrate and plant the last five flags, including some of Winship's earliest transplant patients, such as Joyce Wilson (transplanted in 1981) and Ronnie Hyatt (transplanted in 1982). 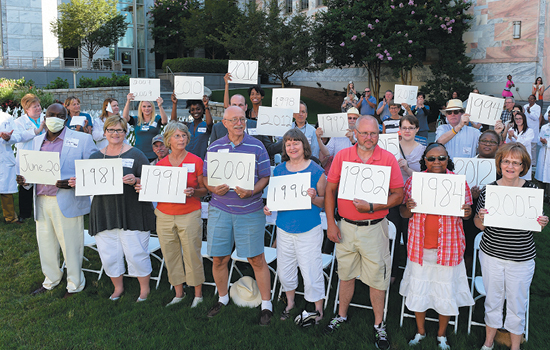 BMT recipients held up signs with the year of their transplants and joyously reunited with doctors and nurses who had cared for them. Winship's Bone Marrow and Stem Cell Transplant Center was one of the first of its kind in the country when it started transplanting patients with blood cancers and blood disorders in 1979. 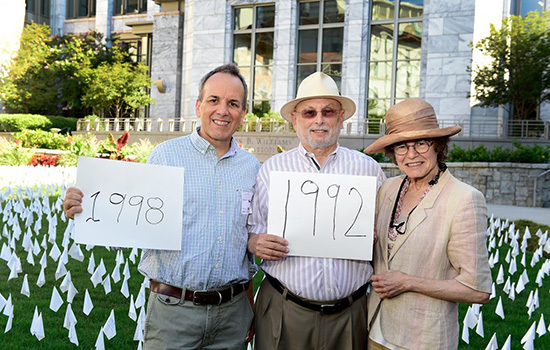 It started with two hematologists who saw the potential of this new treatment: Elliott Winton, still a practicing physician and researcher with the Winship hematology team, and retired hematologist Ralph Vogler. "This is death-defying treatment. If we can cure somebody, particularly somebody with many years left of good quality of life, that's one of the biggest thrills of my career," says Winton. Visionary leaders, researchers, and nurses grew the program over its 37-year history into a center that now performs this life-saving procedure for over 430 patients a year. 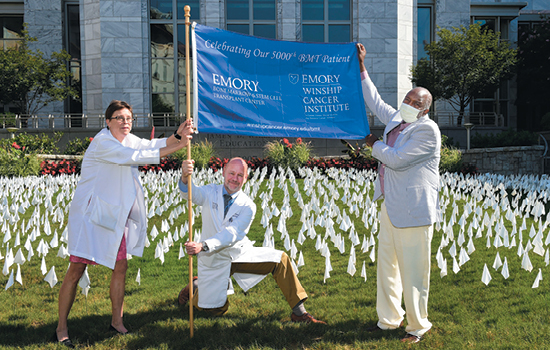 Winship's Bone Marrow and Stem Cell Transplant Center was one of the first of its kind in the country when it started transplanting patients with blood cancers and blood disorders in 1979. Here is the story of how visionary leaders, researchers, and nurses grew the program over its 37-year history into a center that now performs this life-saving procedure for over 430 patients a year.